Contaminated by Frank Kozik‘s experimental nuclear radiation project, Kidrobot emerges tentacle-armed and triple-eyed accompanied by an “enhanced” Labbit sidekick. This limited piece hits stores this Thursday, March 18, but you can secure your own ray of radiation by winning KidMutant in the Fallout FotoMash Contest! Win! 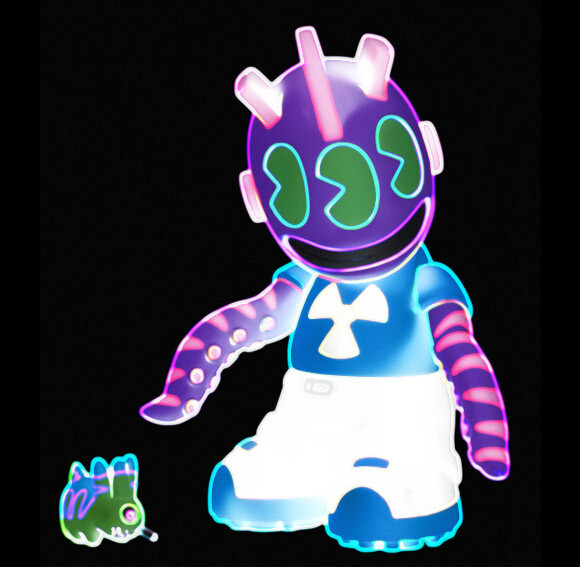 The entry with the most positive feedback on Thursday 3/18 at 5pm EST wins Kidrobot 18: KidMutant! Enter early and often! You can enter and vote as many times as you want, coerce friends to do the same, but remember, you can only vote once on any entry. Embedding an image in your comment is a little tricky. The easiest way to submit a photo is to upload it to your Flickr account. Login to your account, visit the image you’d like to embed and click the Share This button. Copy the code from the “Grab the HTML” section and paste it into your comment. Next, visit your image online and right-click it and select “Copy Image Location” or “Copy Image Address”. Now, paste your Image Location between the quote marks in the code you selected above. Please note that all images bigger than 580 pixels wide will get chopped off horizontally. Please make your image 500-580 pixels wide or smaller for best results. The post KidMutant Fallout FotoMash Contest appeared first on Kidrobot Blog.